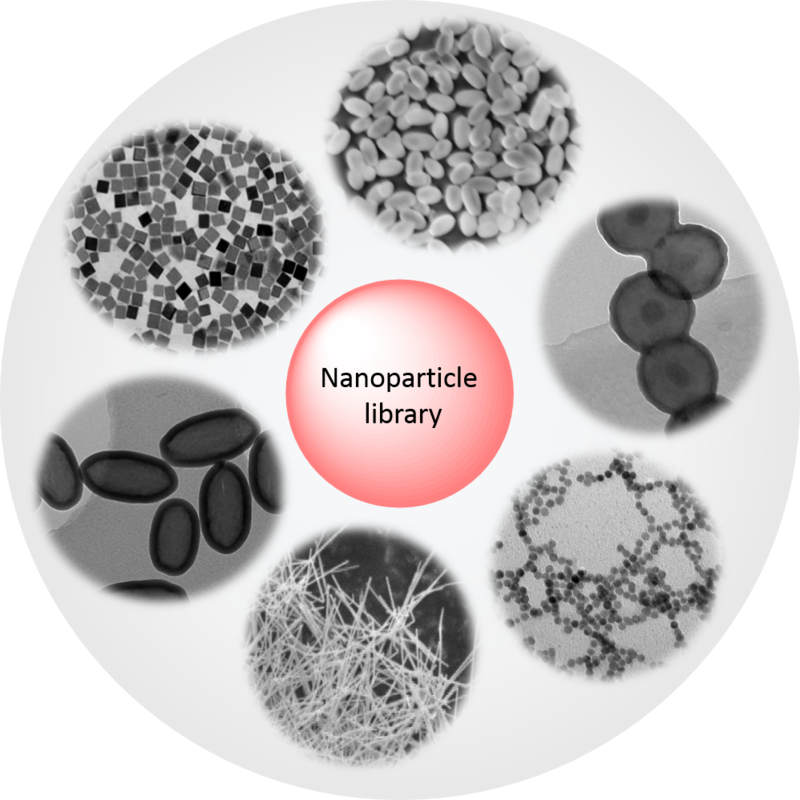 Our workgroup has built up a large library of nanoparticles from metals such as gold and silver to oxides like SiO2, TiO2, several iron oxides (α-Fe2O3, γ-Fe2O3,..) and spinel structures (MFe2O4), whereby the morphology can vary between cubic, spherical or rod-like. Additionally, combinations of aforementioned materials can result in core-shell structures or can be used as templates for hollow particles. Several different methods for the preparation of nanoparticles are well-established in our labs with the most common ones being solvothermal or microwave treatment, but also co-precipitation and hot-injection are employed. One main focus of the workgroup is the modification of nanomaterials for medicinal purposes. The choice of the core material and the surface ligands is therefore of crucial importance. Besides their functionality, biocompatibility needs to be ensured in order to avoid adverse effects of the particles in the organism. This can be performed by coating the particles with biomolecules such as proteins, but also natural substances including green tea and vitamin C have been employed in our group. Further functionalizations with radioactive labels or dyes or by using magnetic materials results in platforms which are especially suitable as imaging agents for diagnostic purposes. Additionally, these nanoparticles can also be employed as carriers for drugs or oligonucleotides like DNA. Therapeutic applications in our workgroup are mainly focused on cancer treatment and antibacterial effects. You want to discover the persons behind the research? Click here!